It takes 5-6 weeks for the heart to heal after a heart attack. During this recovery stage, it is important that you get enough rest, but it is also important to get a moderate amount of exercise. Cardiac Rehabilitation is a monitored exercise program that combines education, exercise, and support for people who have had a heart attack, heart surgery, or other condition related to the heart. 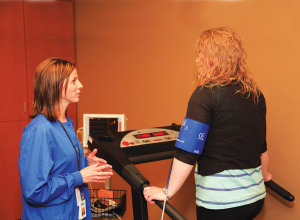 During rehabilitation, we will watch your heart rhythm on a heart monitor while you exercise. We will guide you through a series of exercises to strengthen all of your muscles, including your heart. This includes starting an exercise program, making dietary changes and helping your family adjust to a healthier lifestyle. Your cardiologist or surgeon will refer you to Cardiac Rehabilitation to assist in your recovery and you will be contacted by one of the cardiology nurses to set up your appointment and rehabilitation schedule. Central Minnesota Heart and Vascular Center from St. Cloud provides outpatient services at SCBHS twice a month. Patients can be seen by a cardiologist, have a stress test, or echocardiogram. For questions or to schedule an appointment, call 320-843-1318.